My life is anything but easy. I hardly sleep (not the baby's fault either, it's my back problems! ), money is tight since I went to working part time after Landon was born, I never get caught up on the household chores, hardly find time to make dinner, and time for myself? Forget about it! BUT - I wouldn't change it for the world! I am so thankful this year for my amazing husband! This will be our second Thanksgiving as a married couple, but the first where it really feels like we are MARRIED!! (Last year we were still newlyweds) He is so good to me and works so hard for our family. Most importantly - he is an amazing father. I am SO thankful for that! I adore watching him interact with Landon and watching how Landon's face lights up when he sees his daddy! I am thankful for our home. We've been here about a year and a half now - the first time we've stayed anywhere longer than a year in the entire time we've known each other! We love our home and we love where we live. Sure, it's starting to feel small as the baby stuff takes over, but I am so thankful that we were able to buy a home and provide a stable place for our son to grow. I am thankful for my parents. Without them I would not be the person I am today. I am thankful for the way they support me and are always there for me. I am thankful for the way they always offer helpful advice without making me feel pressured to do it that way or making me feel like I am doing it wrong. I am thankful for the example they led for me as parents. I am thankful for the way they respect me as a parent. I am so thankful that I have such awesome parents. I am thankful that we live nearby so that they can babysit - there is nobody I would rather watch my son other than me or Matt! I am thankful for my little brother and sister! They are an awesome aunt and uncle for Landon and the best brother and sister I could hope for. I wish I could see them more, but I am thankful that they are only as far away as the bay area! I am thankful to get to see them when they visit home too! I am thankful for my friends! Even though we are distanced by so many miles - we still remain friends. I am thankful for the effort put in by all of them to remain in contact and spend time together despite the distance. We have friends in many different places and I love them all! I am thankful for all my new amazing mommy friends! Such an amazing network of support that I have gained as I became a mommy. I am so thankful to have found this incredible group of women. I am thankful for my new job. Although I would rather not work and stay home with my baby - I am thankful that this opportunity came up at the right time. Although I cannot stay home full time as I would love to - I get to work short days and I'm only 10 minutes from home. Most of all this year I am thankful for my son! I am so lucky that I get to be mommy to this awesome little boy. My life has been so much richer and so much more meaningful since he came into the world! I never could have imagined the love I would feel. I am thankful that he is healthy. I am thankful for successful breastfeeding. 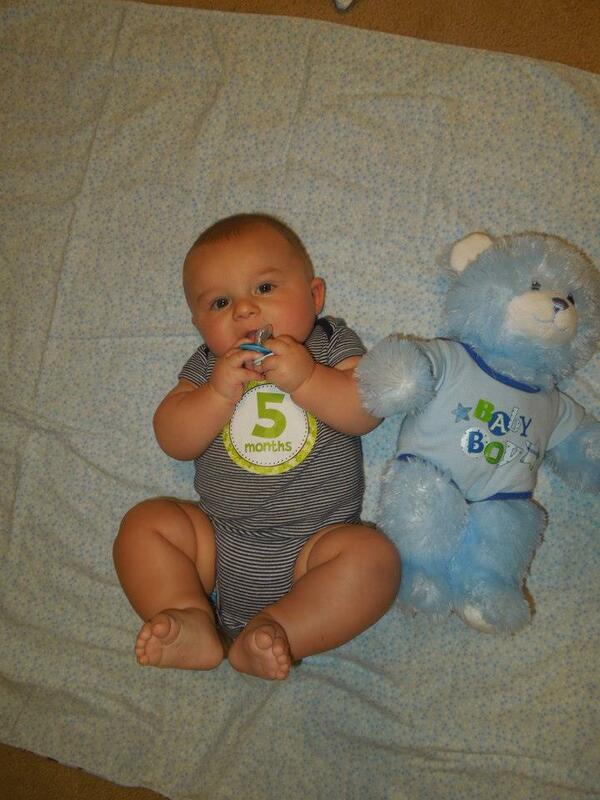 I am thankful that he continues to gain weight - although I wouldn't mind if he slowed down just a bit!! I am thankful that he is such a happy boy and that he is such a good sleeper! I am thankful for his snuggles and smiles and laughter. I am thankful for every inch of that precious baby. I am in awe that he is mine. Really the word "thankful" doesn't even capture the way I feel. I don't think there is a word that truly captures it. "Lucky" is the best I can come up with. I feel so darn lucky. 5 month old little monkey! This month has been a big one for milestones! 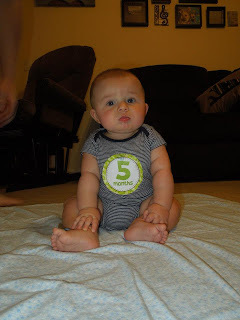 He learned how to roll from his tummy to his back (although he has refused to do it again after showing off the skill about 6 times on the day he learned it). 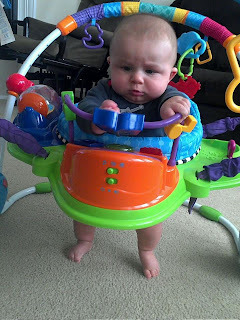 A few weeks after that and he is sitting up completely independently. He will still fall from time to time, but it is rare now and he can sit for 15+ minutes - such a big boy!! He is playing with toys more now too. 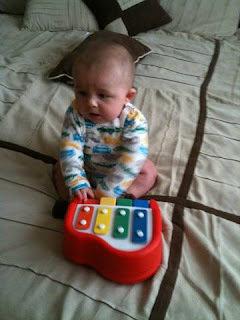 We bought him a cute little toy piano and he had a great time banging the keys on that and making music with his daddy. 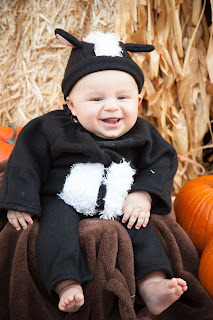 Landon also had his first Halloween this month! He was the cutest little skunk! He officially found his feet this month and is working hard at getting them into his mouth!